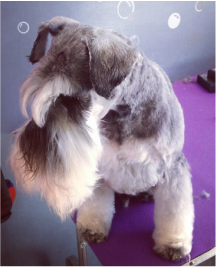 Actual prices are determined based on each individual pets coat type, condition, behaviour and specific requirements, so we are happy to offer a free initial assessment which provides a no obligation opportunity for you and your pet to get to know us and for you to tell us about any special grooming requirements you may have. face and tail styled to suit your dogs personality. For ﻿in between﻿ grooms or short coated breeds a bath and tidy includes light brush out, warm hydrobath, hand dried and tidying feet, sanitary areas and hair from eyes. For severely matted dogs your dog will be clipped to the safest length possible so s/he is comfortable stress free and happy. 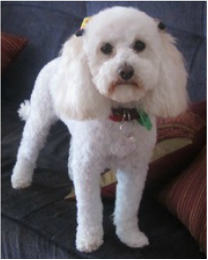 This service does incur an extra charge on the full groom service.click here for matted coats explained. The Fluffy Puppy Clip includes nails clipped, sanitary areas tidied, warm hydrobath, coat hand dried and coat clipped with a hand scissored finish making the coat look more plush. Breed specific clips for those who like their dogs to resemble their breed specific cuts. Includes nails clipped sanitary areas tidied, warm hydrobath, coat hand dried, and then scissored to meet breed standards. 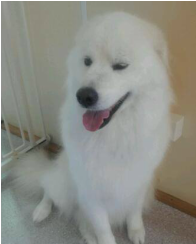 For long haired double coated breeds the de-shed includes the removal of any loose undercoat, nails clipped, warm hydrobath, coat hand dried and sanitary areas clipped if needed. If you suspect your dog has fleas we recommend using a monthly topical treatment and washing of all bedding before getting your dog groomed for a more effective treatment. This is because flea baths only kill the adult fleas on your dog and not the eggs or the fleas in your pets bedding, and therefore less effective in eliminating all fleas. If we find that your dog has fleas during the grooming process an automatic $15 flea service will be charged. If you are having trouble with fleas on your pet please refer to my blog on fleas or consult your vet.